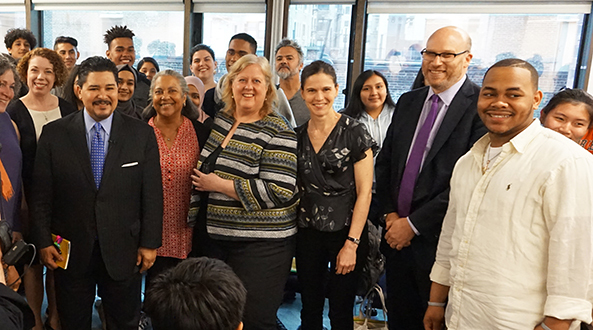 On May 27, Bank Street College hosted New York City Schools Chancellor Richard A. Carranza and students from the International Network for Public Schools’ “Future Teachers Club” for conversations about how to become a teacher and about teaching and learning in classrooms where students learn English. During the event, the high-school students—who themselves are aspiring teachers—met with Bank Street educators and the chancellor for a lively discussion on the particular challenges and opportunities teachers face when teaching English to speakers of other languages. Approximately 40 students gathered in a Graduate School of Education classroom and discussed topics of interest to educators who teach language, including what it takes to become an effective teacher who understands how to help students learn and thrive in school settings and beyond. In addition to Carranza, students heard from Bank Street President Shael Polakow-Suransky, GSE ’00; Nilda Resnick, Course Instructor at the Bank Street Graduate School of Education; Robin Hummel, Program Director in Math Leadership at the Bank Street Graduate School of Education; and Valentine Burr, Chair of the Department of Teaching and Learning at the Bank Street Graduate School of Education.